About the Company : Since its inception in 2000, SPEC has been providing customized solutions from concept to commissioning for a variety of clientele in the most harvest and challenging terrains. • Requesting quotation from various suppliers for the requisitions from Vessels, Diving, Survey, Commissioning department, Project Material from Project MTO etc. • Get approval from requester, to enter Purchase Order for processing and liaise with supplier for delivery. • Tracking Shipment and notify Vessel Agent for clearance and delivery on board. • Arranging Trailer, Truck & Crane requirements for Yard/commissioning dept projects and Vessel Mob-Demob support etc. • Crew change notification to Vessel Agent for all vessel crews on operational mode. • Co-ordination with Logistics Manager for preparing Project/Vessel/Agent contact list. • Vessel Crew/Passenger List in order to advice vessel clearing agent for the clearance. • Preparing Proforma Invoice, Packing List and Delivery Note for project item movements from yard to project site and DG/NDG Letter for shipments. • Drafting letters and faxes, Scanning documents for shipment clearance authorization purpose. • Arranging Port pass for incoming personnel to our yard and vessels. • Follow-up for Safety Certificates after Quality testing prior vessel mobilization. • Preparing and sending required documents to Vessel Clearing agents and Clients in order to get permission for vessel in foreign waters. • Providing all documentation required by the client in a timely and professional manner. • Maintenance of Department’s monthly Time sheets and administrative forms required for the Logistics department. • Coordinating with Marine and Diving department to facilitate scheduling of crew change and logistics. 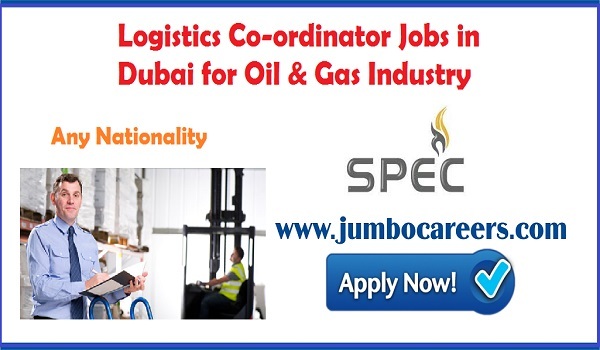 How to Apply : Latest Logistics Jobs at SPEC Energy DMCC Dubai- Apply Now.